Master songwriter Peter Holsapple has been fairly quiet since moving back to North Carolina post-Katrina, reappearing mainly for short-lived reunions of the dB’s and the Continental Drifters. These twin releases—the first a lost 1978 session, the second his first solo album in two decades—mark a welcome return to action. 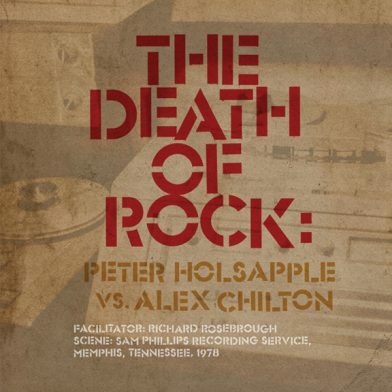 The billing of the Holsapple vs. Chilton album reveals what’s going on: One of these two people cared deeply about Chilton’s previous band Big Star, and it sure wasn’t Chilton. Thus Holsapple was trying to craft resonant pop hooks while Chilton was stomping on them; his covers of “Train Kept a-Rollin’” and Bo Diddley’s “Hey Mona” both lean toward the chaos of his next proper album, Like Flies on Sherbert; and the two Big Star remakes sound like attempts that didn’t get very far (Chilton’s reinvention in New Orleans was quite a few years away). They connect better on Holsapple’s tunes: “House Is Not a Home” is a sharply melodic (and yes, Big Star–ish) ballad; “Bad Reputation” is far more British Invasion than the later dB’s version and possibly better. If nothing else, there’s a sense of adventure here that both carried into their future. Holsapple’s best songs have always had an emotional double edge—the dB’s Repercussion remains one of the most exhilarating albums of miserable songs you’ll ever hear—and he’s only sharpened it on Game Day. The title track nods to John Fogerty’s “Centerfield,” replacing its wide-eyed optimism with a more dogged kind, and posing the question “Do I still have what it takes to pull this off?” during a chorus hook that proves he does. Elsewhere the songs look at the complications, and occasional downright messiness, of life at a certain age. A couple of them settle old scores with friends and lovers, and it doesn’t get more unflinching than “Inventory,” about cleaning up after a death in the family—this one rivals Jason Isbell’s “Elephant” as lump-in-throat material. Yet this isn’t a depressing album overall; most tracks lean toward a garage-y update of the dB’s era. Even without a full band present (Holsapple plays most everything), tracks like “Yelling at Clouds” and “The Smartest Thing I’ve Ever Done” evince a scrappy joy that undercuts the crankiness in the lyrics. The two highlights are both love songs, if unconventional ones: “Don’t Ever Leave” is a gentle plea addressed to an unspecified musical hero that the singer couldn’t bear to lose—a sentiment that rings especially true after the past couple of years. And “Continental Drifters” is an affectionate and beautifully sung look back at their time together, done in full Drifters style with accordion and mandolin. It should be just as affecting for people who loved that band as for people who were in it. Lovely harmonies by Susan Cowsill on “Continental Drifters”…man, I miss that band.